Recently my office moved to new location close to Yonge St. There are many negatives for me with this move but one of the positives is that now I am a five minute walk away from one of my favorite places in Toronto, the Beer Bistro. Tonight my first beer was from a California brewery I have never heard of before, Firestone Walker Brewing Company, and I almost didn't try it. I saw Firestone Walker Double Barrel IPA (5% APV) listed in the bold ales section of the beer menu and set my mind on trying it. When Sarah, my server, who even though the place was jammed made sure me and everyone else in my section were well looked after, asked what I would like, I pointed a the beer on the menu, said what I wanted, then hesitated and said no. Well the 355 ml bottle (12 oz) had a $10.75 price on it! Then knowing how well the staff is trained at the Beer Bistro and how knowledgeable they are about their beers, I asked her if she has tried it. She said yes and had never found a Firestone Walker beer she didn't like. OK, that was good enough for me. Now a little about the brewery. 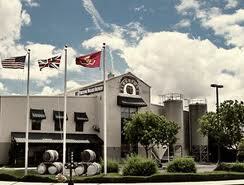 The brewery was founded in 1996 by Adam Firestone and David Walker, hence the name of the brewery. Back then, Firestone loved to make wine and neither really had any experience in fermentation but started playing with beer recipes. 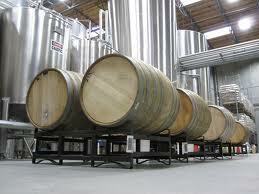 With Firestone's experience in wine making, they decided to use 60 gallon barrels in the brewing process. After a few failures they worked the 60 gallon barrels into a union system similar the the Burton Union system that I have written about before, which they call the Firestone Union system. For the Double Barrel beer, the mix beer fermented in the oak barrel fermented beer is blended with beer fermented in stainless steel. According to the website, the DBA is brewed in the style of an English Bitter with a combination of five different malts and four hops. In the end, another style hop is added to Dry Hop the beer. Sarah made a perfect pour but I was a little slow in getting a picture of the full head. It pours a light brown in colour, with a slight brownish head. In the aroma, I could sense some floral hops in the aroma. The beer starts of a little watery in mouthfeel but then along comes a little bitterness, followed surprisingly by a dose of citrus. There is layers of flavour in this beer. Some bitterness does stay in the finish which trails of quickly, again replaced by a final thought of citrus. If I am ever in California or any other state that carried this beer at a reasonable price, I would certainly enjoy having a few of these.